COLOBUS monkeys are not so much all fingers and thumbs, as just all fingers. Bioparc Fuengirola’s tree-dwelling Colobus have adapted to their environment in a unique way. Unlike other monkeys, these Kenyan kings of the swingers have no thumbs. 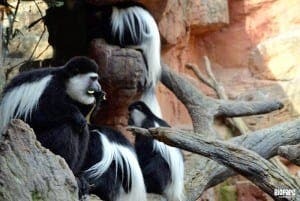 This evolution allows the Colobus to avoid getting hooked up in branches when they leap through their natural habitat.